Behold! The disciples said: O Jesus, son of Mary, can your Lord send down to us a table from heaven? Jesus said: Fear Allah, if you are believers. They said: We only wish to eat of it and satisfy our hearts, and to know that you have indeed told us the truth and that we ourselves may be witnesses of it. Jesus, the son of Mary, said: O Allah our Lord! Send down to us a table from heaven, that there may be for us – the first and the last of us – a festival and a sign from you; and provide for our sustenance, for you are the best sustainer. Allah said: I will send it down to you; but if any of you after that resists faith I will punish him with a penalty such as I have not inflicted on anyone among all the peoples (Surah Al-Maida 5:112-115). “Being united is a response to the act of horror and barbarism,” said Imam Otaman Aissaoui. “It’s an occasion to show (Muslims) that we do not confuse Islam with Islamism, Muslim with jihadist,” said the Rev’d Jean Rouet. 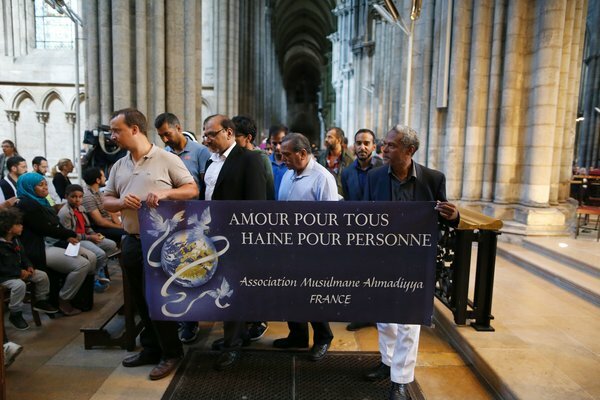 “Today we wanted to show physically, by kissing the family of Jacques Hamel, by kissing His Grace Lebrun in front of everybody, so they know that the two communities are united,” said Mohammed Karabila, President of Saint-Etienne-du-Rouvray Mosque. But his second link does not state anywhere that “‘Many of the Muslims’ attending mass there were Ahmadiyyas”. 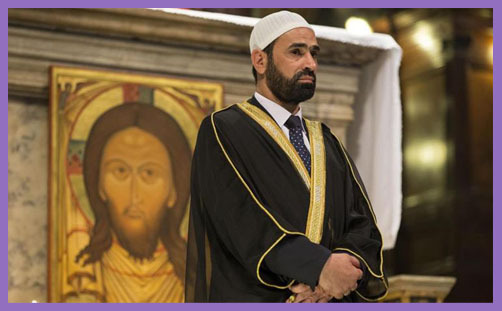 Indeed, that piece refers specifically to exhortations from the head of Italy’s Union of Islamic communities, Izzedin Elzir, and the Secretary General of Italy’s Islamic Confederation, Abdullah Cozzolino, neither of whom is Ahmadi.